2. Place spaghetti squash face down in a large baking dish, fill about halfway with water. 3. Place in oven at 375 for 45 minutes or so. 4. Remove from oven, shred with a fork while hot (use caution). 5. On the stovetop prepare the sauce mixture by combining liquid ingredients first then adding in dry ingredients to prevent sticking. Cook in a medium-sized pot on low-medium heat until it reaches a boil and is mixed well. 6. As sauce is heating and squash has cooled some, scoop out the spaghetti squash in a large mixing bowl, leaving the shell casing in the glass baking dish. 7. Add sauce mixture to spaghetti squash, mix until well combined. 8. Place spaghetti squash mixture back in the shell casing in the glass baking dish, filling both halves equally. 9. Prepare the keto breaded topping by mashing in a bowl. 10. 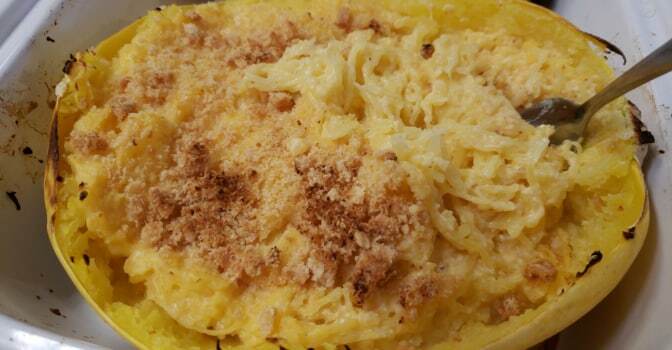 Place breaded topping evenly on top of your prepared spaghetti squash mac-n-cheese. 11. Place spaghetti squash back in the oven for an additional 15 minutes or until mixture starts to boil. Add an additional 5 minutes on broil to crisp the keto breading. Watch carefully so it doesn’t burn. 12. Remove from oven, sprinkle with pink Himalayan salt and enjoy. This is a delicious replacement for the carb-loaded mac-n-cheese we used to eat as a family. We ate it as a side with dinner, allowing for the carb count. Check out the Spaghetti Squash Nutrition label if you are wanting to be more accurate with carb count. The way I see it, we are eating something lower in carbs and real food as compared to the box of shelled imitation macaroni. I will take that as a win any day. Check out some other delicious low-carb/keto recipes using spaghetti squash. Thanks for the shout-out for my Cheesy Low-Carb Spaghetti Squash round-up! You are so very welcome! Love the recipe!